RUSH: So Slay the Nation yesterday, or Deface the Nation, however you wish to call it, on CBS, John Podesta, the former campaign chairman for Hillary’s presidential bid, was a guest. And the CBS infobabe, the hostette, Nancy Cordes, asked Podesta how the Russians knew to focus on Michigan and Wisconsin and Hillary didn’t. Now, the Russians didn’t really do the — but the media thinks they did. So we’re gonna run with that. The media is convinced that the Russians secured victory for Trump in Michigan and Wisconsin by gumming up the works there. They can’t read the indictment. They don’t know how to read the indictment. They’ve got their preconceived belief, and that’s what it is. PODESTA: Well, of course we spent a lot of time and energy and effort in all those states. CORDES: Hillary Clinton herself did not spend much time in those states. PODESTA: We — you know, we had, uh, Tim Kaine was there, uh, Barack Obama was in — and she spent enormous time in Pennsylvania and Michigan. We had more, uh, staff in Wisconsin than even President Obama had in 2012. But, but I think that begs the question. I think we — we focused on the places we thought were, uh, that were, you know, in contest. And, uh, at the end of the day, we fell short in those states, uh. And I think that this active measures, uh, effort by the Russians could have tilted the election in, uh, Donald Trump’s favor. RUSH: No, no. No, no, no. No, no, no, no. The god Robert Mueller has said that did not happen. In this narrative PR statement called an indictment that came out Friday, they said the Russians’ activity had no bearing on the outcome of the election, sir. I mean, the premise here is so absurd, it’s funny, except it’s serious. These people actually believe the Russians are the reason Trump won in their states. And that indictment gives them further reason to believe it. 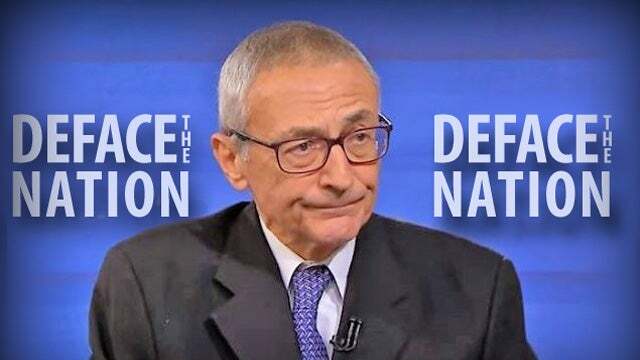 Washington Free Beacon: CBS Host to Podesta: Why Did the Russians Know to Focus on Michigan and Wisconsin When Clinton Didn’t?